I love this alternate version of "Will The Circle Be Unbroken" from a great 40s gospel group. Then the men set out from there, and they looked down toward Sodom. And Abraham went with them to set them on their way. The Lord said, "Shall I hide from Abraham what I am about to do, seeing that Abraham shall surely become a great and mighty nation, and all the nations of the earth shall be blessed in him? For I have chosen him, that he may command his children and his household after him to keep the way of the Lord by doing righteousness and justice, so that the Lord may bring to Abraham what he has promised him." Then the Lord said, "Because the outcry against Sodom and Gomorrah is great and their sin is very grave, I will go down to see whether they have done altogether according to the outcry that has come to me. And if not, I will know." After their meal and discussion, Abraham and the three men apparently travel as normal men would — probably by donkey — until they reach a high point overlooking the city of Sodom, in the Jordan Valley. The Lord speaks, not in true meditation, but in a form that Abraham is able to understand. He lets Abraham know, in effect, that He has taken him into his confidence. He is continuing the human relationship with Abraham by speaking to him as one person would to another. He takes this form of interaction to an extreme. God has no need to "go" to Sodom in the form of a man, with limited mobility and vision, to investigate whether the allegations against it are true. He know exactly what has happened. But He is taking Abraham into His confidence; because He is to trust Abraham and his offspring with the sacred duty of representing Him on earth, He is making Abraham a full member of the team, so to speak. This is also a kindness because Lot, remember, chose to establish his household in the area. So Abraham is to be consulted, although in reality He is consulting Abraham much as a parent would consult a child. A parent might tell a child, "Do you want to leave the cookies in the oven for a minute and see what happens? ", knowing full well that they need to cook for another minute. 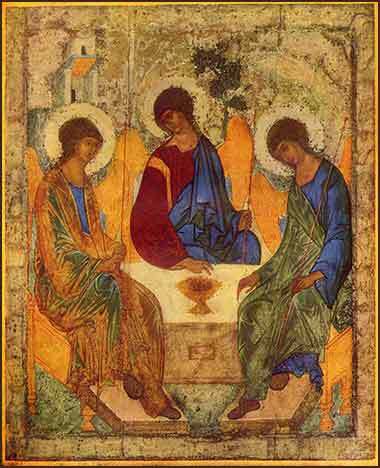 In this icon of Abraham's three guests, the table has become an altar and the dish upon it resembles a Communion vessel.